derio patiuntur, dilaniantur, vruntur, occumbunt. Allez donc mes souspirs aux cyeux. Sans la pouuoir cacher, s'y est ouuert le iour? Essayant ce que peut l'embrassement d'Amour. Den Hemel siet mijn soete minn'. Vliech op mijn hert/ en treckt daer in. Love is nourished by desires; now desires result from love like heat from fire, and they are as it were ignited arrows, that the heart of the lover shoots towards the beloved. This is why it will be impossible for anybody to become inflamed by the sacred heat of desire if the costs are not compensated by a great reward.2 For he who operates less out of passion than out of action3 indeed achieves very little, although he acts a lot. The prophet Daniel did not deserve to remain ignorant of the secrets of heaven because he fasted, but because he desired, for the angel said "now I have come to show to you, because you are a man of desires".4 And who can make fully known in words the desires of the saints? Only those who have experienced these feelings know those of lovers; how often through desire they suffer, are tortured, burnt, die. If they could, they would be as quick to hold their own through action, as they are now prone to lust through their desires. The power of love is immense and is not stopped short by any bound; just as it feeds of itself, so it expands in itself; it does not need another's support, it is self-sufficient, so long it can exercise its power. Not Ps. 34, but 37(38):10. 'This is why ... by a great reward': the meaning of the Latin is quite obscure, and the translation is given exempli gratia. 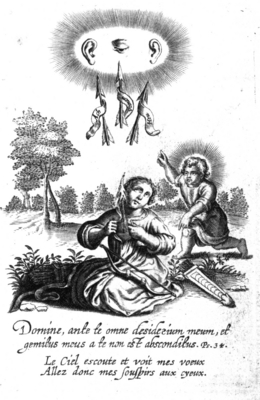 'less out of passion than out of action': the somewhat punning use of actus and effectus in the Latin ('what one does' and 'what is done to one' respectively) is based on the idea that lovers operate a lot of things, but in fact they are mainly operated on, manipulated, viz., by love, and the beloved. 'a man of desires', 'vir desideriorum': the standard translation of 'desideriorum', 'much loved', would not make much sense in this context. 'Man of desires' is a literal translation of the Hebrew original, meaning "a much beloved man", which is the translation found in vernacular versions of the Bible. E.g. : "I am come to shew thee; for thou art greatly beloved" (KJV). 'Lord, all my desire is before thee; and my groaning is not hid from thee' KJV (in KJV Ps. 38:9).